Taysom Hill plays more than you’d expect from a backup to Drew Brees’s backup. Saints head coach Sean Payton uses Hill as a change-of-pace QB, usually to run the read-option, and he’s logged at least seven offensive snaps in every Saints game this year. Hill had more run earlier in the season when he was playing around 20 percent of Saints snaps—he’s decreased to 10 percent now—and he’s thrown six passes and rushed 33 times this season. 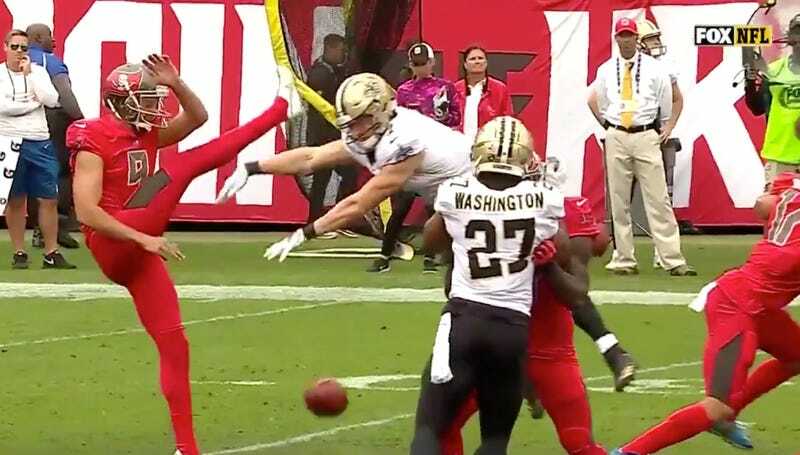 However, while Hill’s offensive usage has fallen off in recent weeks—Drew Brees is not too shabby—he has distinguished himself once again on special teams. Hill made an impact on the punt coverage team last season, and in Sunday’s game against the Bucs, he perfectly swept inside from the edge and blocked Bryan Anger’s punt with ease. The Saints were down 14-3 in the third quarter when Hill blocked the punt. That field position culminated in a five-play, 30-yard touchdown drive. New Orleans ended up scoring 25 unanswered points and running away with the game. “You call those momentum-changing plays, right?” Brees said. “We all recognize when you have those games where you’re struggling to get something going, you just need one thing to just ignite the team, ignite the sideline, and get you going. “Obviously that was a huge play in the game. We go down and score a touchdown and score on every possession after that, I think. The undrafted quarterback out of BYU also sometimes returns kicks for the Saints, and though he’s listed as a QB and has been vocal about his desire to grow as a passer, Hill has happily taken any role the Saints will give him. He gives hope to backup quarterbacks, as well as kids named Taysom, everywhere.